The Bottom Line: A tautly-written historical thriller tailor-made for fans of All The Light We Cannot See. 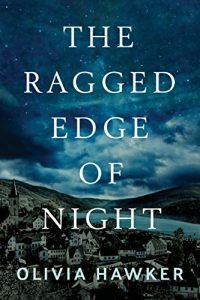 Set in Nazi Germany, The Ragged Edge of Night centers around friar Anton Starzmann, who is stripped of his position during the fascist government’s purge of religious clerics. He seeks solace in a woman who wants help raising her three children, but their ensuing marriage is more partnership than romance. Still, as the world war edges ever closer to home, the heartfelt relationship finds him growing closer to the family than he ever thought possible. Novelist Olivia Hawker’s historical epic picks up considerable steam as Anton joins the Red Orchestra, a group of rebels seeking to topple the government by assassinating Hitler. The odds of both success and survival are minimal, and the effort may mean sacrificing his life. Will he choose his new family or his political conscience? There are so many books and films surrounding the plot to kill Hitler that the subject is practically its own genre. As in any piece of historical fiction, the challenge of creating tension in the face of a decided outcome is daunting. In this case, the knowledge that Hitler ultimately survived until the end of the war has an unavoidable dampening effect. In the absence of major narrative surprises here, we are left with one man’s journey for atonement, heroic and profound as it might be. But fortunately, as protagonists go, Anton is among the more compelling characters to accompany on such an incredible journey.